Shoresh's Environmental Programs has received two significant awards for outstanding achievement in the past weeks. Shoresh at Bela Farm is the only Canadian project to have been included in Slingshot this year. 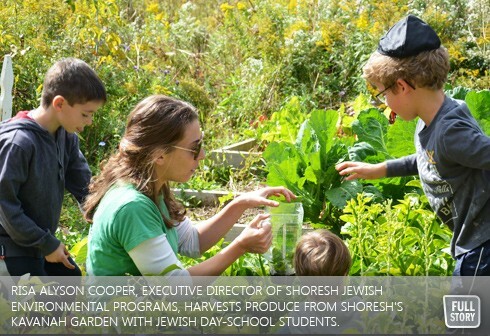 In the realm of Jewish education, it was announced this past Sunday that the founder of Shoresh, Risa Alyson Cooper, has been selected as one of five promising Jewish educators as a 2013 recipient of The Covenant Foundation’s Pomegranate Prize. She was awarded the prize for for her exceptionalism as an emerging professional in Jewish educational settings across North America. In addition to these honours, Risa has been a recipient of a US based Natan Foundation Grant; and is a participant in the Joshua Venture Fellowship. She is the only Canadian ever to have been acknowledged by four major foundations supporting innovation in the Jewish start up sector. Through experiential education and action, Shoresh creates meaningful Jewish life and builds a more sustainable and inspired community. Shoresh programs include the Kavannah Garden situated on the Joseph and Wolf Lebovic Jewish Community Campus and Bela Farm outside of Guelph Ontario. Shoresh is a resident at Genesis-UJA’s Centre for Jewish Innovation located at the Wolfond Centre for Jewish Student Life on the campus of the University of Toronto. Genesis supports and nurtures Jewish start-up organizations in the GTA by providing free workspace, staff support, mentorship, education and guidance. “With Risa’s leadership, Shoresh has developed a creative, fun and meaningful outlet for members in the community to express their Judaism. Innovative organizations such as Shoresh allow the community to embrace young Jewish adults with projects that speak to them.” Says Cheryl Reicin, chair of the Genesis Advisory Board. “Projects such as Shoresh demonstrate the talent, passion and vision of young social entrepreneurs in our Jewish community and the need for a place and space that supports the Jewish start up sector. UJA Federation is proud to be playing a role in nurturing Risa’s success as well as that of Shoresh” says Robin Gofine, Vice President, Community Planning and Engagement, UJA Federation of Greater Toronto. For more information about Genesis please contact alexandra@cjitoronto.org. For more information about Shoresh please contact Tamar Ungar at tamar@shoresh.ca.